Just posted by “jasonlv” on another BB. Its a Vitamin E complex containing ALL 8 forms of Vitamin E in a powder form to add to water etc. It has received a US Patent for hair growth in 2007. Its only $29 for a 60 day supply. A randomized, double blind, placebo-controlled two groups parallel study was conducted to compare the effect of a mixture of tocotrienols, comprising α-, γ-, and δ-tocotrienols and alpha-tocopherol, with placebo on hair growth. All volunteers were randomized to receive one capsule comprising either (i) a mixture of tocotrienols and alpha-tocopheral, or (ii) a placebo, twice daily after food over a period of at least 5 months. They were seen for an efficacy evaluation every month throughout the study. The control was a placebo capsule containing 600 mg of soya bean oil, and the tocotrienol formulation consisted of capsules containing a mixture of about 50 mg of tocotrienols and about 23 i.u. alpha-tocopherol. The entire study took 15 months for completion. Although the preferred embodiment of the formulation is in the form of soft gelatin capsule, other oral pharmaceutical dosage forms are not excluded. The preferred dosage range of tocotrienols for oral consumption is from about 20 mg to about 1500 mg/day. The formulation may also be applied topically and may be in the form of a cream, a lotion, an ointment, a gel, a liquid, or any other topical form. The concentration of tocotrienols used in the topical formulation is about 1.0%, and the minimum concentration of tocotrienols in any formulation is about 0.1%. Volunteers of 15 years of age or older and in good general health were recruited into the study. Alopecia must have present for least 2 months and the areas alopecia must not have any visual evidence of new hair growth. Volunteers previously exposed to minoxidil were ineligible to participate in the study, as were patients who have used hair-restorers or systemic drugs like steroids, antihypertensives, cytotoxic compounds, vasodilators, anticonvulsant drugs, β-blockers, spironolactone, cimetidine, ketoconazole, estrogens or progesterons within the previous three months. Patients experiencing hair loss due to thyroid disease, adverse drug reactions, scalp or hair trauma, structural hair shaft abnormalities and lichen planus were excluded from the study. Two parameters were chosen to evaluate the efficacy of tocotrienols and alpha-tocopherol supplementation: i) Hair count–hair count served as the primary efficacy measure. An area of 2×2 cm was selected in the area of hair thinning for each patient, and the two opposing corners of the square were permanently marked (using a 4 cm2 wire template) to ensure that the hair in the same area was counted at each visit. ii) Weight of hair–a small tuft of hair (at least 20 strands) within the demarcated area was clipped horizontally. Twenty strands were randomly chosen and cut into 1 cm in length. The total weight was obtained using a microbalance and the mean weight was recorded. All of the two parameters were obtained at baseline and every month thereafter during the study. Only the terminal hair growth was recorded and analyzed. Nineteen patients (14 men and 5 women) entered the study and completed at least the first 5 months of therapy. Their ages ranged from 23 to 59 years. The mean duration of current alopecia episode was approximately 5 years. The extent of alopecia was as follows: less than 25%, 6 patients; 25 49%, 8 patients; 50 74%, 4 patients; 75 99%, 1 patient. Eleven volunteers were randomized to receive the tocotrienol formulation supplementation while 8 volunteers were in the placebo group. Comparability of the treatment groups with respect to initial hair counts as well as the weight of hair was assessed. No statistically significant difference between treatment groups was detected for any of the above characteristics. At the end of the supplementation period, all volunteers in the tocotrienol formulation group had positive results, recording an increase in the number of hairs in the evaluation area. Seven volunteers (64%) showed regrowth of between 10 35% while 3 volunteers (27%) had 50% or greater regrowth. One volunteer had regrowth of more than 100%. The mean percentage of increase in the number of hairs is 42.4±40.9% (mean±SD). (Table 1 and FIG. 1). The increase is statistically significant (p<0.05) when analyzed using paired sample t-test. On the other hand, of the total eight volunteers in the placebo group, two showed hair regrowth, two had hair loss while the other four did not show any significant changes in the number of hairs. The mean percentage of increase was 1.4±13.8%. No statistically significant difference (p>0.05) in the number of hairs was detected between baseline and post-supplementation, thus indicating that the placebo effect did not occur during this study. However, in terms of the weight of the hair, no statistically significant difference (p>0.05) between pre- and post-supplementation was detected for both groups of volunteers (tocotrienol and placebo). The mean percentage of weight increment was 16.4±42.5% in the tocotrienol formulation group while that of the placebo group had an increase of 5.7±40.1%. (Table 2). The above-mentioned studies therefore indicate that supplementation with a formulation comprising a mixture of tocotrienol, alpha-tocopherol and pharmaceutically acceptable excipient appears to promote hair growth and increase the number of hair in persons experiencing hair loss. The choice of pharmaceutically acceptable excipients will be obvious to those skilled in the relevant art. Acceptable excipients include any inert, compatible substances added to make the final dosage forms, for the formulations, such as tablets, capsules, or soft gelatin capsules. For example, vegetable oil can be added as an excipient to make up the volume for the encapsulation of soft gelatin capsules. As such, a pharmaceutically acceptable excipient includes any excipients that are approved for use by the relevant authorities and are compatible with tocotrienols. DHT inhibition- Finasteride, Saw Palmetto, Rivoflavin, Green Tea Extract, Copper, Peptides, and Topical Bayberry Extract. PKC down regulation - Grape Seed Extract, Resveratrol, Vitamin E, Soy Isoflavones. TNF-a down regulation- Curcumin, Ginkgo Biloba Extract, Stinging Nettle Extract, Green Tea Extract, Fish Oil, Borage Oil, Perilla Oil, and Topical Perilla leaf extract. TGF down regulation- Curcumin, and topical Amacha. If you read the above article, it further confirms the possibility of using Curcumin for both TNF-a/TGF down regulation and Vitamin E (Toco-8)/Resveratrol for PKC down regulation. A DHT inhibitor along with Curcumin & Toco-8 is a cheaper alternative to comply with their anti-inflammation protocol. As Resveratrol can be quite expensive then a combo such as Greens First (a cheaper way of getting Resveratrol), which contains 100mg Resveratrol + 100mg decaff Green Tea, could be used along with Curcumin, in addition to a DHT inhibitor. DHT inhibition - Finasteride, Saw Palmetto, Rivoflavin, Green Tea Extract, Copper, Peptides, and Topical Bayberry Extract. 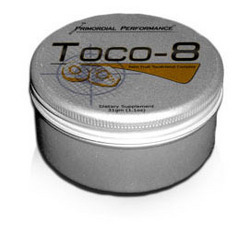 Primordial Performance introduces Toco-8 – a natural tocotrienol supplement designed to encourage testosterone production, while preventing hair loss. So TOCO-8 INCREASES Testosterone levels, hence DHT levels. This has the OPPOSITE effect of Finasteride. Col, great information on TOCO-8. It is something that I would definitely like to try in the near future. When I posted that information on curcumin, the librarian Pete2 pooh poohed it; but I’ll wait and see what he does now. Have you looked into Maca root, as something to regulate the amount of estrogen in our bodies, thereby potentially increasing the amount of testosterone we can produce? I already use Indole-3-Carbinol (I3C) very successfully to treat my Estradiol levels. Probably one of the most important products i use. I have emailed my question about TOCO-8 increasing T, hence DHT, to the TOCO-8 manufacturers Primordial. I really like the sound of TOCO-8 but the last thing i want is to increase my T levels. As for Curcumin, i am a strong believer in its abilities to treat various diseases although its effectiveness for hair-loss, (other than the Italian study and Hounty saying topical Curcumin completely stopped his hairloss) is still to be proved. An excellent article regarding Curcumin appeared on LEF’s website recently. It makes for very good reading. I began using both LEF’s BioCurcumin and the topical Psoria Gold curcumin cream last week . I bought it because i thought it was a colourless Curcumin cream as opposed to the yellow HPL curcumin cream used by Hounty. The main hook of the PR was the fact that you could actually do BOTH with a single natural nutrient. Despite a negligible increase in DHT (from possible T stimulation) the tocotrienols are still capable of protecting the hair and encouraging regrowth. Toco-8 may not be a total cure for all men who have alopecia or hypogonadism, but it is certainly a step in the right direction. Some argue that it’s the excess estrogen that causes hair loss, and not the testosterone (which, in and of itself, is not a bad thing, right). Men need testosterone. Yes, any hormonal imbalance can wreak havoc and cause alsorts of problems,including hairloss. For example, excess Estradiol also interferes with normal Thyroid function which can cause Hypothyroid which,in itself, can cause dry/brittle/thinning hair all over the scalp, not just the top. As my Fin just doesn’t work anymore then,logically, DHT is no longer the problem in my case hence my attack on both Estradiol & Inflammation. Once these are under control i believe the Fin will work as it did before. Most people seem to forget that the TWO known main causes for hair-loss are DHT AND Inflammation. BOTH must be kept under control. » can cause dry/brittle/thinning hair all over the scalp, not just the top. » AND Inflammation. BOTH must be kept under control. If you look at some of my older posts I was talking about the imbalance years ago. It is actually important to keep DHT in check as well as Estradiol. » » problem in my case hence my attack on both Estradiol & Inflammation. » » these are under control i believe the Fin will work as it did before. » » AND Inflammation. BOTH must be kept under control. also they do not state if it was areata or mpb. my conclusion is: probably just another scam. hmm…do you think a claim in such a patent is a lie ? » hmm…do you think a claim in such a patent is a lie ? Scam. Notice the disclaimer at the bottom of their site. You can claim anything you want in a patent - a patent simply protects a product’s design, it does not validate its efficacy. That is what the FDA is for. The FDA did not conclude that TOCO-8 was a “scam.” YOU did. » design, it does not validate its efficacy. That is what the FDA is for. You will see this same disclaimer on EVERY supplement. Your logic is a little fuzzy. I am not saying that this is or is not a scam, but the addition of the disclaimer means nothing. In fact, I believe that it may be required by law. By the way, the identity of Maneless was posted about ten or eleven YEARS ago on Alt Baldspot. Most of us (unfortunate) veterans knew his identity or name a long, long time ago. » or name a long, long time ago.